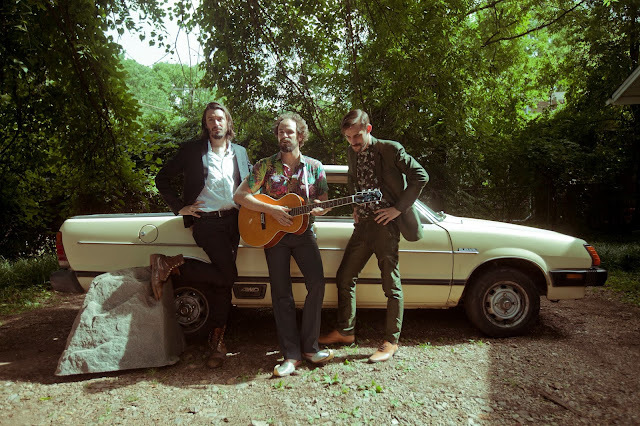 Call them a super group if you want, but Traveller’s Robert Ellis, Jonny Fritz, and Cory Chisel don’t really care if you call yourself a fan. With five solo albums between the three of them, these quick-witted songwriters aren’t interested in clunking down the music business conveyor belt. Instead, they’re turning their attention to crafting catchy and memorable country music. JONNY FRITZ: March 2nd is the release date here. JONNY: Oh, the pay is incredible. CORY CHISEL: The exposure, alone! JONNY: The opportunities! Free sunglasses! JONNY: And $700 rooms! In Pflugerville! There’s a dog motel I really like to stay at… a kennel. ROBERT: That’s the real story. We were hanging out in Jonny’s backyard, and we said we should start a band…. And then we told Cory that he was in it. And then we booked a tour! JONNY: And then we ran into a promoter, the guy who books Newport Folk Festival, and Robert approached [him] and were like “hey, we’ve got a new band: me, Jonny, and Cory Chisel. Will you book us at Newport?” …And the three of us had never, at that point, actually hung out. JONNY: By the time we could actually find time to get together and write and the festival… I think it was two weeks. JONNY: I would rather only do Traveller stuff, honestly. CORY: I think one of the things that we’re experiencing ...is that individually it’s lousy being a singer/songwriter by yourself. But then getting out there with a bunch of guys that are, legitimately, not here for the fans. We’re here because we love to play these songs and we really hope that the audience does too, but if they don’t then we’re good. CORY: And we mean that with all the love in our hearts.